A basic garden design package with the design drawn up from the information provided in the information pack. No revision is included in this pack but it can be added at any time. You can also add planting plans, construction drawings and specifications to this option. A garden design based on customer supplied information including one revision to allow you to ammend the design according to your wishes. 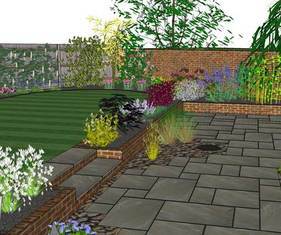 You can also add planting plans, specifications and construction drawings to this option. A large garden design based on customer supplied information including one revision to allow you to ammend the design according to your wishes. 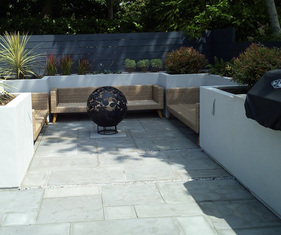 You can also add a large planting plan, specifications and construction drawings to this option. A set of drawings showing how each item in the main design is constructed including which materials to use, sizes, etc. A planting plan based on a small garden design up to 300m2. A planting plan based on a large garden design over 300m2. A written specification detailing the materials used and how each item within your garden design is constructed. Additional revisions can be used to ammend a design or change the design to accomodate alterations to your requirements.